To confuse matters even more, some knowledgeable plant people look at it and say, “Well, of course, it’s not a fern; that’s a spike moss, or club moss.” Now, actually, this is true, but in reality a “spike moss” isn’t a true moss either. Confused yet? Yeah, I thought you might be. Hang in there, though; it will all become clear, I promise. Now is where we get to the good part…and the reason the plant marketers felt they had to dream up a catchier name. The correct name for this pretty little plant is Selaginella kraussiana, a name that almost rolls off the tongue…sellaahhginellaaahhh. What do you think? No? That’s what I thought. Okay, it’s enough for me that you are at least now aware that this plant is not a fern and not a moss. So let’s talk about what it is and how to take care of it. This selaginella certainly could be mistaken for a fern, with its tiny leaves and wispy appearance. 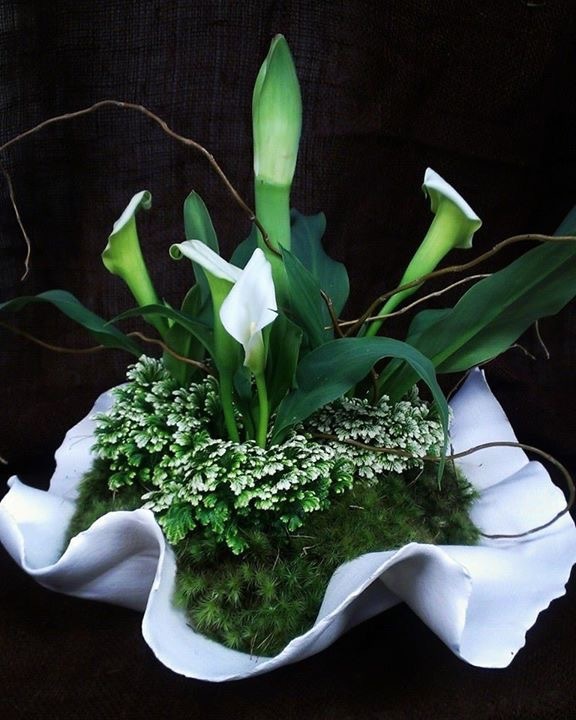 But, if you look closely, the leaves are flat and look forked. Which, I suppose, is also how it comes by its other common name, spike or club moss. The coloring of the leaf tips is natural; another selaginella, Selaginella uncinata, sometimes called peacock moss (Now it’s a moss; see how confusing this gets? 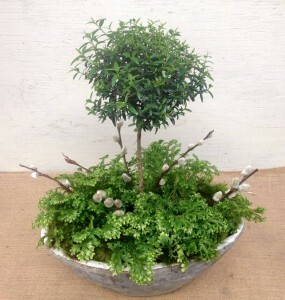 ), has beautiful iridescent blue-green leaves. These plants are actually part of an interesting group of plants called fern-allies, not actually related to ferns but sharing the same reproductive means – spores. Selaginellas have become naturalized in parts of Portugal, Spain, and New Zealand, though they’re originally from Africa. They make quite wonderful terrarium plants since they’re happiest with good humidity and consistent moisture during the growing season. Like most plants, growth slows in fall and winter, so be sure to cut back on the water during those months and let them dry a bit between drinks. Try to keep the humidity up as high as possible, especially if you plan on keeping one in your home through the winter months when your furnace is running and air gets drier. 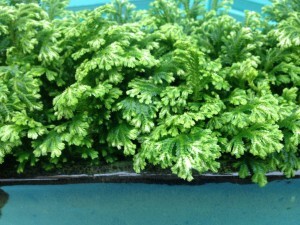 An easy way to do this is to place your selaginella on a shallow tray of pebbles filled with water just to the bottom of it. Sit your pot on the pebbles, taking care not to sink the pot in the water. 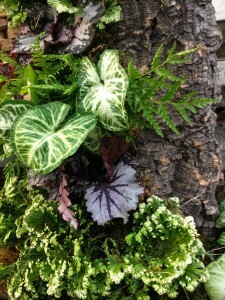 As the water evaporates it will add moisture to the air around your plant. They prefer temperatures above 50 degrees, the perfect range being anywhere from 75 – 80 degrees F. If temperatures drop lower, the foliage can be prone to fungal problems and the tips of their tiny leaves will turn brown. So, if you are using them in outdoor shade planters through the summer, keep this in mind as the temperatures cool in the fall. Bright but indirect light is best, either early morning or late afternoon if inside. Too much direct sun will cause the leaves to wilt and burn. 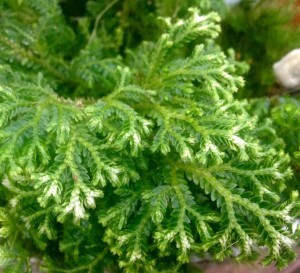 Be careful not to over feed your selaginella, as too much fertilizer can also cause wilting and yellowing of leaves. So, whatever you choose to call it, you now know its proper name (And don’t we all want to be called by our correct name? ), and the marketing gurus haven’t got the last word after all! This entry was posted in Ferns, House Plants, Indoor landscape, Indoor Plants, Terrarium and tagged care of selaginella, club moss, frosty fern, selaginella, selaginella kraussiana, spike moss on January 26, 2015 by Kris Blevons.